Special is "a distinctive and uplifting new series about a gay man, Ryan with mild cerebral palsy who decides to rewrite his identity and finally go after the life he wants." On February 5, 2019, Netflix announced that it had given the production a series order for an eight-episode first season, set to premiere on April 12, 2019. The series is created by Ryan O'Connell, who is credited as an executive producer, alongside Jim Parsons, Anna Dokoza, Eric Norsoph and Todd Spiewak. Production companies involved with the series were slated to consist of That's Wonderful Productions and Stage 13. Alongside the series order announcement, it was confirmed that Ryan O'Connell, Jessica Hecht, Punam Patel, Marla Mindelle, Augustus Prew, and Patrick Fabian would star in the series. On March 25, 2019, Netflix released the first official trailer for the series. On review aggregator Rotten Tomatoes, the series holds an approval rating of 90% with an average rating of 6.33/10 based on 10 reviews. The website's critical consensus reads, "Honest and genuinely affecting, Special lives up to its name with a funny — if a bit too concise — first season brightened by Ryan O'Connell's infectious charms. On Metacritic, it has a weighted average score of 65 out of 100, based on 7 critics, indicating "generally favorable reviews". Variety gave the show a positive review calling the main character "quick and snarky, deeply insecure and sometimes more selfish than he’s willing to admit. He makes mistakes and pays for them, undergoing a hell of a lot of change in the short time 'Special' gets to show it." TV Guide gave the show a mixed review saying that, "Hopefully Special gets a second season with a bigger budget, a writing staff, and more time to plan. The way Season 1 improves as it goes along shows Special still has a lot of potential." ^ Pedersen, Erik (December 26, 2018). "Midseason Premiere Dates For New & Returning Series: 2019 Edition". Deadline. Retrieved February 20, 2019. ^ "I'm Special: And Other Lies We Tell Ourselves to Get Through Our Twenties". www.publishersweekly.com. Retrieved February 20, 2019. ^ Petski, Denise (February 5, 2019). "Netflix Orders Ryan O'Connell Comedy Series 'Special' Produced By Jim Parsons". Deadline. Retrieved February 20, 2019. 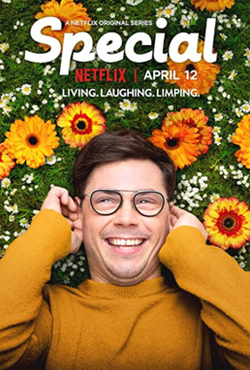 ^ "Netflix's upcoming series, 'Special' explores the life of a disabled gay man". The Rustin Times. April 9, 2019. Retrieved April 11, 2019. ^ Nakamura, Reid (February 5, 2019). "Netflix Orders Cerebral Palsy Comedy Series 'Special' From Ryan O'Connell, Jim Parsons". The Wrap. Retrieved February 20, 2019. ^ Rodriguez, Matthew (February 6, 2019). "A Comedy About a Gay Man with Cerebral Palsy Is Coming to Netflix". www.out.com. Retrieved February 20, 2019. ^ Porter, Rick (February 5, 2019). "Netflix Orders Jim Parsons-Produced Comedy Series". The Hollywood Reporter. Retrieved March 21, 2019. ^ a b Nordine, Michael (March 25, 2019). "'Special' Trailer: Netflix Series Shows the Highs and Lows of Being Gay and Disabled". IndieWire. Retrieved March 29, 2019. ^ "Special – Listings". The Futon Critic. Retrieved March 21, 2019. ^ a b c d "Ryan O'Connell and Jim Parsons' Special is Coming to Netflix". Netflix Media Center. February 5, 2019. Retrieved April 11, 2019. ^ Shepherd, Jack (March 26, 2019). "Special trailer: New Netflix series' lead character is gay and has cerebral palsy". Independent. Retrieved April 11, 2019. ^ "Special: Season 1 (2019)". Rotten Tomatoes. Fandango Media. Retrieved April 19, 2019. ^ "Special: Season 1". Metacritic. CBS. Retrieved April 19, 2019. ^ "TV Review: 'Special' on Netflix". Variety. Retrieved April 19, 2019. ^ "Special Review: Netflix Let This Promising Comedy Down". TV Guide. Retrieved April 19, 2019.